The hunting in Vermont is sooo much better! As some of you might know, I’m away in college. Hence my lack of posts or customs (sadly). After at least a dozen cars got damaged after my display case fell, I was certainly devestated. But man has life taken a turn for the best! I have a new girlfriend, who I think might get into it herself just because it’s so calming. I visited town, and the hunting scene is fantastic! At least compared to back home. First day I went into town, I found 2 RS6 on the pegs of a micheals!!! (Which is better than the 3 Targets, and 2 Walmart’s near me). The Target also stocked some Team Transport, which none of the stores near me stock. And even the Car Culture was up to date, and I got a full set of Circuit Legends! (I didn’t think to grab another set for anyone on here- an oversight I gravely regret). The Walmart had JDM M2s aswell! I even found 2 50th Anniversary 510 Wagons. This may sound common for you guys, but back home the pegs are picked cleaned by other collectors or never restocked. Especially the car culture. At Michaels I did wind up buying a mat, some brushes, and some testers paint to at least detail. It’s been an amazing stress reliever! The MOMO Porsche was my first one I tried, and as you can see, I have certainly gotten rusty. Those headlights! Yuck! I need to bring my Greddy 962 up - after thanksgiving. But I plan on further expanding my lineup. I have decals based off of the Apple Computers 935, that were adjusted to fit a 962. Figured it’d look cool. I’m also thinking either a 962 recreation of another historical livery- BFGoodrich, Yokohama, Lowenbrau, Blaupunkt, or Jagermeister (Hi R32! Lol). The new Mazda 787b is interesting- I’m surprised I haven’t seen a Renown recreation yet, but I’m sure one is in the works somewhere. To the best of my knowledge, I’m one of the few people with a Rothmans 962. The only other I’ve seen was made my @jamespeterpan on IG, which is now in the hands of our fellow R32Rennsport. 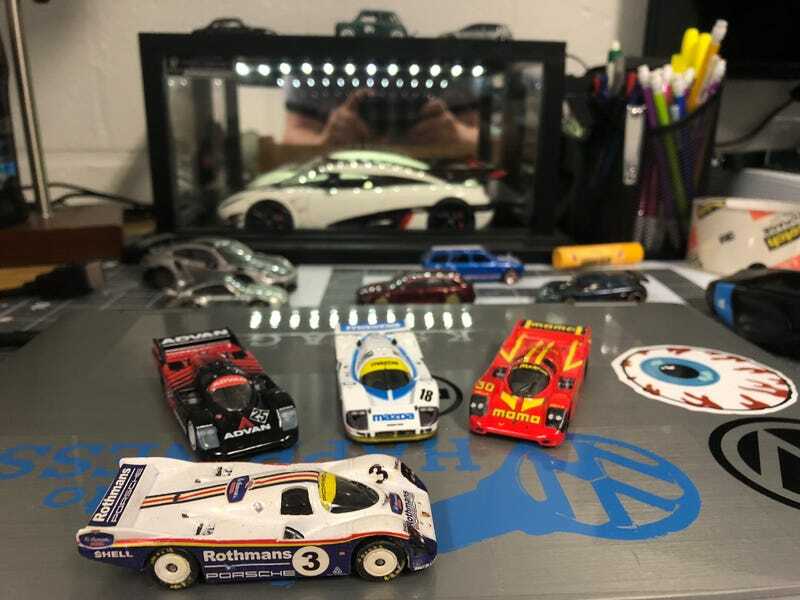 Regardless- my most immediate plans include adding mirrors to all the 962s, and the 787b. Just have to hit up the local Home Depot for some copper wire. I also need to swap out the wheels on the Momo 962 ASAP. Anyway- thanks so much and until next time!